1. Heat your Black Knight barbecue and lightly oil the grills. 2. In a medium bowl, mix together minced lamb, sultanas, goat cheese, mayonnaise, red onion, garlic, coriander, cayenne pepper, cumin, ground coriander, salt and black pepper. 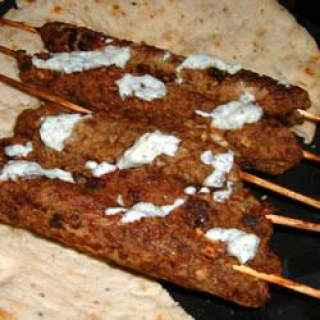 Divide the mixture into approximately 6 even portions, and press around skewers. 3. Place skewers on the BBQ. Cook approximately 4 minutes per side, or until the cheese has melted, the sultanas are tender and lamb has reached desired doneness.